Solo: A Star Wars Story Sets Announced for August! Help Tobias Beckett protect the precious coaxium from Enfys Nest and Weazel on their super-fast LEGO® Star Wars 75215 Cloud-Rider Swoop Bikes! Each speeder has big engines for maximum speed and is armed with powerful stud shooters. Will Tobias escape before the greedy gangsters steal the coaxium? That’s for you to decide with this exciting LEGO Star Wars set! Includes 3 minifigures: Tobias Beckett, Enfys Nest and Weazel. Features 2 sleek swoop bike speeders with open minifigure cockpits and stud shooters. One also has a sidecar and space to store the included box of coaxium. Weapons include Beckett’s 2 blaster pistols, Enfys Nest’s weapon and Weazel’s blaster. Swoop bike without sidecar measures over 3â€ (9cm) high, 7â€ (19cm) long and 1â€ (5cm) wide. Jump aboard the speeding LEGO® Star Wars 75217 Imperial Conveyex Transport with Han and Chewie for a daring raid! Dodge the gun on top and clamber onto the cargo wagon. Pop the sides to reveal the precious coaxium, but watch out for the Range Troopers with their magnetic boots—they could appear from anywhere! This LEGO Star Wars tracked locomotive is stopping for no one! Includes 5 LEGO® minifigures: Han Solo, Chewbacca, an Imperial Gunner and 2 Range Troopers. Imperial Conveyex Transport features an engine section with opening front revealing a wraparound tank track, opening driver’s compartment and a weapon store. Imperial Conveyex Transport with cargo wagon measures over 4” (12cm) high, 16” (43cm) long and 3” (9cm) wide. Detachable, wheeled cargo wagon features opening sides and top hatch, a movable rotating gun turret with 2 stud shooters, a hitch at the back and studs on the side for the Range Troopers to walk on. Inside, there’s an access ladder leading to the top hatch and space for the 4 included coaxium containers. Also includes 4 coaxium box elements in containers. Tilt the train from side to side, just like in the movie. Weapons include Han’s blaster pistol, Chewbacca’s sawed-off blaster rifle and the Range Troopers’ blaster rifles. Make believe the Range Troopers have real magnetic boots and climb them up the sides of the train! Combines with the 75215 Cloud-Rider Swoop Bikes and 75219 Imperial AT-Hauler for the ultimate high-speed train heist. Hitch up multiple sets for an even longer train! 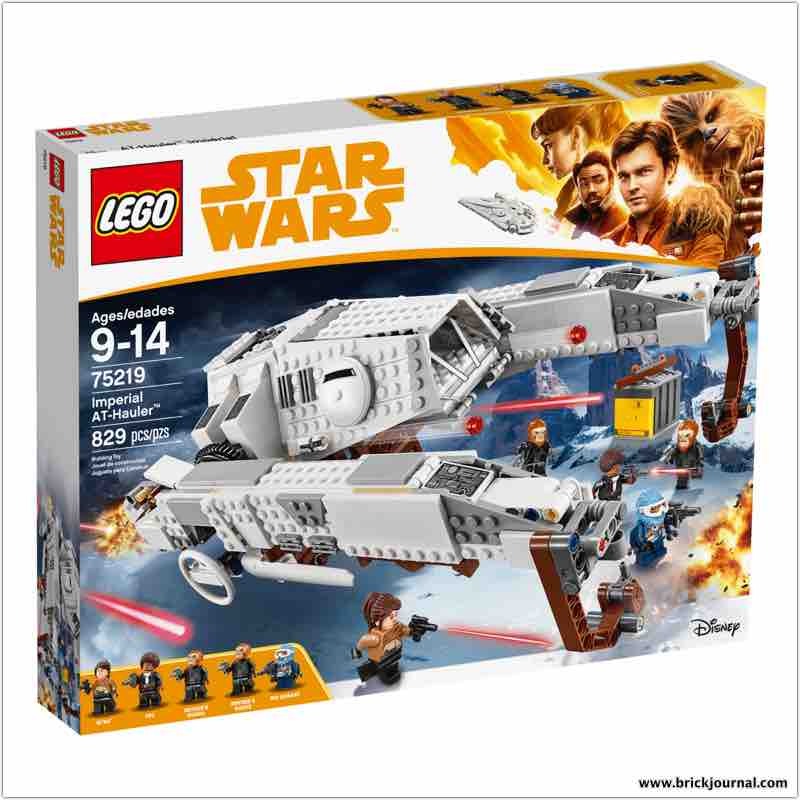 Transport heavy cargo with the LEGO® Star Wars 75219 Imperial AT-Hauler! Sit Qi’ra in the cockpit and Beckett crew members Val and Rio Durant on the platform underneath, fire up the engines and lift off. Rotate the lifter arms and fly into position above the cargo. Then latch on and lift it into the air for another on-time delivery. If Dryden’s guards try and hijack the precious cargo, fire the stud shooters to send them running! Features rotating pylons with movable lifting hooks, an opening minifigure cockpit, side-mounted stud shooters and a platform underneath for carrying minifigures. All of these will be available at LEGO.com, LEGO Brand Retail Stores and other retail outlets August 1, 2018. LEGO Reveals Summer LEGO Batman Sets for Batman’s 80th Anniversary! The LEGO Group Introduces LEGO® HIDDEN SIDE™, Combining Building With Augmented Reality to Create a New Way To Play!